The Google Play store has a sparse collection of ergonomic apps. To be frank, none of these apps blew us away. 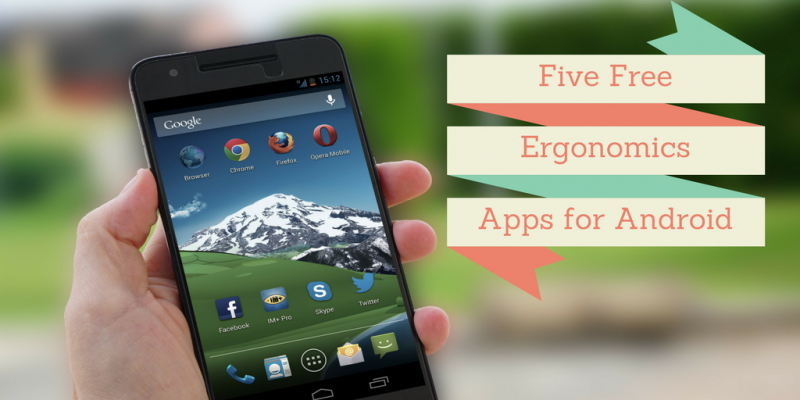 In a nutshell most of the apps we found were ergonomic tip apps. A couple were timers and measurement calculators. Some were in foreign languages. Your mileage may vary with these apps. We don’t think you’ll be worse off for installing any of these. None of these apps will replace a good ergonomics book or reading a bunch of really good ergonomic blog posts. But we definitely recommend checking at least one out. Vidamic UP! Vidamic UP! helps you remember to vary your posture during your working day by simply reminding you to stand up. By varying your posture, you will feel healthier in the long run and it also helps you avoiding injuries that can arise from monotonous working positions. Vidamic UP! is easy to use and has three pre-programmed alternatives. If you are a beginner, simply choose ”Beginner” and the app will automatically set the most suitable settings for you. You can also customize your own schedule that works best for you by selecting the days and hours that ts your particular work day. You can also easily pause or discontinue the session at any time. We at Vidamic Ergonomics are specialists in creating ergonomically designed workplaces. Our well-designed products provide a healthy work environment that prevents and relieves problems. The result is reduced suffering for the affected person and less costs for the employer in terms of days off for sickness and rehabilitation. MMH Calculator Free. With this free version of the MMH Calculator (Manual Material Handling) the recommended weight limit for lifting tasks can be calculated. The calculation is based on the revised NIOSH lifting equation. This method is internationally established, and is e.g. used by Dutch Labour Inspectorate. 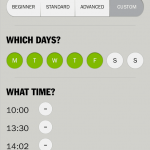 The app is applicable for working situations with lifting tasks. After input of several characteristics of the lifting tasks, the recommended weight limit is calculated, and the associated risk is indicated. Moreover, it becomes clear how the lifting task may be improved. Please read the Info tab in the app: in some lifting situations the NIOSH method may NOT be applied. Shortly, the Pro-version of the MMH Calculator is expected; it also contains other physically loading activities like pushing, pulling, and carrying. Office Ergonomics. Do you spend long days at your computer? This essential app will help you set up your workstation correctly to prevent discomfort and injury. Don’t delay your body will thank you! This step by step guide is loaded with animated graphics and helpful tips to help you quickly optimize your set up for comfort. These practical solutions will help you make the most of what you have, and potentially identify what you may be missing. Don’t set up your office or buy furniture without this app! 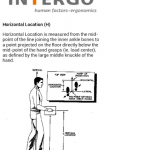 ILO Ergonomic Checkpoints. The Ergonomic Checkpoints app allows you to create interactive checklists of ergonomic checkpoints to use in the workplace. There are 132 checkpoints in total. The app also includes best practice recommendations for taking action and implementing effective improvements in ergonomics in the workplace. Who is the app for? The app is designed for use by anyone concerned with creating a better workplace: employers, supervisors, workers, inspectors, safety and health personnel, trainers and educators, engineers, ergonomists and designers. WorkPose. WorkPose guides you step-by-step through the process to adjust the position of your desk and computer to help eliminate back, arm, shoulder and hand pain at work. This personalized, self-guided program promotes fitness, health, posture, work breaks, and movement at your desk. Increase your energy and productivity at work, decrease your pain and discomfort! It provides product suggestions with the option to purchase products. 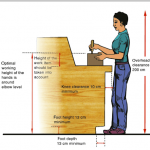 WorkPose leads you through the proper adjustments to avoid work pain. Have some fun and upload a photo and place it on the model of your choice. If you have an app you recommend, let us know in the comments below. We’ll check it out! Thanks.